Yesterday Chris Froome took the overall lead in the Vuelta a España, the first time he’s lead a stage race in the pro ranks. But it’s not the first time he’s worn a red jersey in a grand tour. He joined the Barloworld team in 2008 and rode the Tour de France in their red colours. You might remember Robbie Hunter winning the sprint into Montpellier, the first African stage winner in the Tour de France. You might remember John-Lee Augustyn rolling down a mountain. Team mate Moisés Dueñas was ejected for EPO use. But amongst all of this Froome finished his first grand tour and better still, he took a promising 14th place in the final time trial. He was later sent to school in South Africa. Here he found the sport better developed and soon got an elite licence. By 2006 he took part in the World Championships doing the U-23 road race and time trial in Kenyan colours. 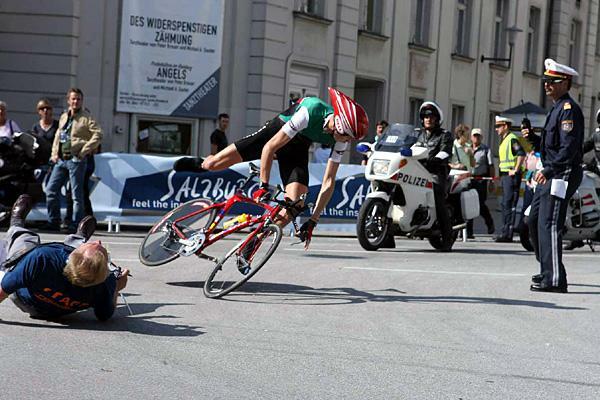 He was briefly famous for a crash caught on camera during the TT. He finished 36th and ahead of the likes of Peter Velits, Brent Bookwalter and Maciej Bodnar. He turned pro with the Konica Minolta squad in 2007. He got several decent results as he divided his time between Europe and South Africa, between the Konica Minolta team and the UCI’s World Cycling Centre in Aigle, Switzerland. The photo at the top is from the Mi-Août Bretonne stage race where he took the overall. By 2008 he jumped to Barloworld and took up racing in Europe full time, including a start in the Tour de France. His two years at Barloworld were quiet but with some decent results, the sort you can’t fluke. Third in the Giro dell’Appennino and on Mont Faron in the early season Tour Méditerranéen too. Fifth in the Vuelta a Asturias time trial stage. A step up to Team Sky for 2010 but the results didn’t jump up dramatically. Injured in the Giro d’Italia, he was disqualified right at the end of the race. But plenty of solid performances, a rider able to climb and time trial. I’d been keeping an eye on him, hoping he could do something. In his two years he has proven strong with many top-10 finishes. But at 26, his lead in the Vuelta after several mountain stages and a long time trial is unexpected. We’ll see how he performs over the coming days but relatively strong performances in the final week suggests he’s got the recovery powers needed. What’s interesting is that his past results suggest anything is possible but at the same time leading the race for a day marks his biggest achievement so far. It’ll help his contract negotiations too. Bradley Wiggins remains the team leader but Froome’s performances give Sky the best cards to play. After posting the piece above, Matt Rendell left a comment below and it’s worth noting the anecdote he mentions. The full story is on his La Vuelta blog with British broadcaster ITV. In 2008 as a subscriber to Cycling.tv’s coverage of the Vuelta I won a Cannondale CAAD 9 frame and forks and a Barloworld race jersey signed by the team including Mr Froome I wore and washed the jersey but not before taking some photo’s of the signatures. I have followed his progress as a rider with interest ever since, great riding both climbing (his known forte) and time trialing. What will Sky’s game plan be for future grand tours with Froome, Wiggins and Cavendish in the team? That’s why you are unique in the way you run your blog! We don’t even have to ask – you just fill out the many blanks we have. Wonder how the mood was at the Sky Team dinner last night; guess it was mixed feelings. A leader’s jersey and showing unknown potential can change your whole career like a stock doing the right movements in front risk willing and hungry investors, and teams will now be hunting the signature – so in the end it might be one of the last dinners at Sky Team. Anyway, a domestic being stronger than the leader has never worked out well in the long run. 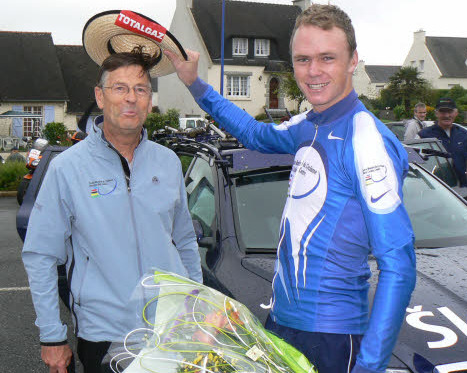 being sans contract bet his agent was almost happier than froome was yesterday. maybe added a zero to negotiations? I heard a wonderful anecdote about Chris Froome and the Kenyan national champion’s jersey. It’s in the Vuelta blog that went on the itv site last night. I mention it not for traffic but because you might be interested. As a European cycling fan who spent my childhood in Africa, I always enjoy reading about African cycling successes. You should do a piece about Team Rwanda (http://teamrwandacycling.org/) as well. Yeah – I have a feeling Wiggens gave him the “talk” last night. He’s in a good position… but can it last. I think he’d be wise to play “loyal team mate” for the time being, just for insurance. Odd to think Sky were ready to drop him but hopefully he can land somewhere good. A good read, I like the way he’s travelled. He is going to be in demand. If he had not ridden the Vuelta I wonder what team he would join?? Of course, if his current team have already indicated that they were looking to part company with him, they shouldn’t be too surprised if he goes and produces a few ‘race-changing’ rides in order to impress the prospective employers out there. Being a loyal teammate is very commendable, but surely he would be entitled to demonstrate his potential while he is on the big stage.. It will be interesting. If he is on his way out, at this point, he needs to prove himself, and very well may become a loose cannon going forward. It will be fun to see the next mountain stage, and see how this progresses. Wiggins is still in good form, and he can sense this is a huge chance for him to finally prove himself to his team, the public and the cycling world in general. Obviously not on the same level, but I sense this could be a little bit like the old Lemond-Hinault 1986 Tour. Does this become a rather uncomfortable situation for the DS’s if the domestique looks like he has more legs than the team leader? I appreciate that Wiggins looks strong in Spain (its not the same as the 2010 Tour). Whats interesting is the discussions about accomodating Cav. Surely the debate is how they (if they decide thats the route they want to go down) remove Wiggins as the central focus of the team. Its a bit of a climb down when they are paying him a fortune and didnt cover themselves in glory to poach him in the first place. Sorry – appreciate its a bit off topic (and no I have nothing against Wiggins).